Do You Know All Android Versions Name? Till Now, 15 Android Versions Has Been Released. The Latest One Is Android Oreo(8.0) Which Released On August 21, 2017. Actual Founder Of Android Is Andrew Rubin, Who Recently Released Essential Smartphone. In July 2005, Google Bought Android Inc. For At Least $50 Million. The First Commercially Smartphone With Android OS Was The HTC Dream, Also Known As T-Mobile G1, Announced On September 23, 2017. Recently, Google Signs Agreement With HTC, Buying A Part Of HTC’s Smartphone Team For $1.1 Billion. Android 1.1 – This Version Of Android Named As “Petit Four” – Release Date – February 9, 2009. Cupcake – Android Version 1.5 Named As Cupcake And Released On April 27, 2009. As Per Latest Information, A Large Majority Of People Using Marshmallow Version Which Has 32.2 Distribution And Lolipop Version Which Has 28.8 Distribution In Total. While There Are No Signs Of Android Oreo Distribution. After Touchscreen Devices, Google Further Developed Android TV For Televisions, Android Auto For Cars, Android Wear For Wrist Watches. Google Assistant Which Was Initially Exclusive To The Pixel And Pixel XL Devices Now Expanded To Android Smartphones Running Nougat And Marshmallow. Recently, Google Assistant Make Debut With Bose’s Headphones. A Dedicated Google Assistant Button On Headphone Will Turn Assistant On And You Will Be Able To Talk Or Give Command To Assistant. Google At I/O 2017, Announced “Android Go” OS For Smartphones With Low Performance. This May Release Early Next Year. 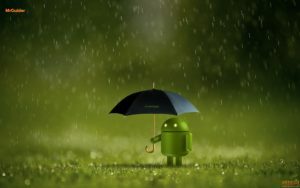 To Protect Android From Malware Or Spyware, Google Launched “Play Protect” Which Scan Harmful Apps Installed In Your Device. Currently, Google’s Safe Browsing Is Protecting More Than 3 Billion Devices.